There comes a time in the life of an artist when he or she is poised to do something truly great, if only the whims of circumstance would allow it. In 1975, the planets had aligned for Stevie Wonder, who was riding high on the success of recent top ten singles such as “Superstition,” “You Are the Sunshine of My Life,” “Higher Ground” and “Living for the City.” His contract with Motown Records gave him full creative control, and a combination of critical acclaim (eight Grammy Awards up to that point) and commercial success allowed him the luxury of stretching his legs on his next project. Songs in the Key of Life eventually hit the record racks in the fall of 1976, a year after its originally anticipated release. What must have seemed an interminable delay at the time is now a mere moment in music history. A rare album like Songs in the Key of Life is worth whatever amount of time its creator deems necessary. The legendary result is a flawlessly executed work of genius. 21 songs written by Stevie Wonder (only four of them with the help of co-writers) with a total running time of more than 100 minutes. An embarrassment of riches that could not fit within the vinyl confines of a double album, and so four of the songs were pressed onto a bonus EP. 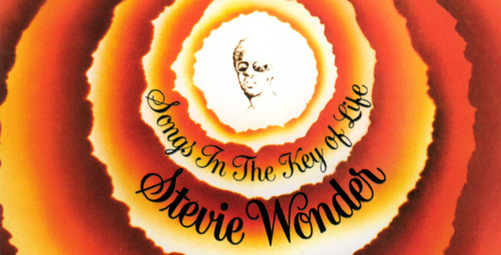 A richly produced work that featured contributions from Herbie Hancock, George Benson and Minnie Riperton, among others, yet three of the tracks were performed exclusively by multi-instrumentalist Wonder. A stunning range of musical styles written, arranged, produced and performed with the confidence of an industry veteran. Astonishingly, though Stevie Wonder was a seasoned talent by the time of the album’s release, he was nevertheless only twenty-six years old. Perhaps the greatest challenge in praising Songs in the Key of Life is deciding where to start. The album is an incomparable success on many levels. A good place to begin, however, is by noting what surely is one of the most breathtaking one-two punches in all of recorded music. The fifth track on the album is “Sir Duke;” the sixth track is “I Wish.” Either of these #1 hits would have sufficed as the highlight of a lesser album, yet Wonder presents these extraordinary tunes early and in sequence, like a fireworks finale a quarter of the way through the show. They are two of the best songs ever recorded, infectiously joyful grooves that any musician would give whatever proverbial piece of anatomy you care to describe to have conceived. By commercial standards, “Sir Duke” and “I Wish” could easily have been hit bookends on an album of filler tunes. It’s almost as if Wonder, his genius overflowing, is nonchalantly tossing off these perfect songs with the knowledge that the rest of the album is really good, too. And he’s right. “Village Ghetto Land” is just one example. Co-written with Gary Byrd and performed entirely by Wonder singing over synthesized strings, the track brilliantly juxtaposes a sobering portrait of inner city despair with a bright and incongruously pleasant classical arrangement. Wonder drives home his point by acknowledging “Now, some folks say that we should be glad for what we have” and then rhetorically asking, “Tell me, would you be happy in Village Ghetto Land?” It’s a devastating final line that remains depressingly relevant today. Social commentary is a recurring theme on Songs in the Key of Life, with “Pastime Paradise” skewering our temptation to revel in nostalgia or stagnate in complacency instead of working to improve the future, “Black Man” highlighting the cultural contributions of different races, and “Love’s in Need of Love Today” lamenting the apparently diminishing compassion of humanity. “Saturn,” one of the four “extra” songs found on the EP, underscores our shortcomings by describing an extraterrestrial utopia from which the alien narrator asks, “Tell me, why are you people so cold?” Yet Wonder never subordinates the music to make his observations. If you never understood a word, you would still appreciate what you were hearing. As with “Sir Duke” and “I Wish,” many of the tracks on Songs in the Key of Life are contagious expressions of pure joy. “Isn’t She Lovely” captures a new father’s wondrous infatuation with his infant daughter. “Knocks Me Off My Feet” is a confession of being helplessly and rapturously in love. “As” is a testimony of love’s eternal nature. Throughout the album, the listener is treated with premier musicianship and clever innovation. There is the rollicking jam of the instrumental Contusion, featuring the lightning lead guitar riffs of Michael Sembello and a tight band performance through a series of unusual changes. Wonder exploits the novel potential of a talk box during Ebony Eyes, a humorously exaggerated tribute to the prettiest girl in the neighborhood. During Summer Soft, a personification of fleeting seasons, a concluding change to a higher key is repeated until Wonder’s boundless voice reaches the stratosphere, leaving the rest of us behind to massage our sore throats. Songs in the Key of Life would earn four more Grammy Awards for Wonder, including Album of the Year, Producer of the Year and Best Male Pop Vocal Performance, as well as a Best Male R&B Vocal Performance award for “I Wish.” It debuted at Number One on the Billboard album chart, where it stayed for thirteen consecutive weeks, eventually becoming the second best selling album of 1977. In 2005, the Recording Industry Association of America awarded it a Diamond certification for domestic sales of ten million copies. Not only is it a great album, it has been justly recognized. Like a painting by one of the great masters, Songs in the Key of Life simultaneously inspires and discourages. It awakens our creativity by showing us what is possible, yet it is an artistic zenith of which very few of us are capable. Stevie Wonder, true to his adopted moniker, is one of those elite beings, and how fortunate we are that he was allowed to soar as high as he could fly during those long months of 1975 and 1976. If Songs in the Key of Life were all he ever gave us, it would have been more than enough.